It has been over a year since Yakuza 0 released and out of all the amazing games that released in 2017 on all platforms, Yakuza 0 is easily my favourite. SEGA’s Yakuza franchise also seemingly ticked all the correct boxes when Yakuza 0 was released only on PlayStation 4 as a perfect entry point into the franchise for newcomers and a fantastic entry for fans. Yakuza Kiwami released soon after that as a remake of the original PS2 entry and while it wasn’t as amazing as 0, it was a fantastic experience. Now we are a month away from the first mainline new numbered Yakuza game release since the digital only PS3 release of Yakuza 5 that was done by SEGA and Sony. Times certainly have changed since then. Yakuza 6: The Song of Life is the first Yakuza game built from the ground up for PS4 with an all new engine. I wrote about the opening hours in my preview here but over the last few weeks, I’ve been going back to it on and off to play mini games and just to revisit it on the PS4 Pro to compare how it looks and runs on both PlayStation 4 iterations. Despite the numbering and how important the story is in a Yakuza game, you can play this as your first entry into the franchise. 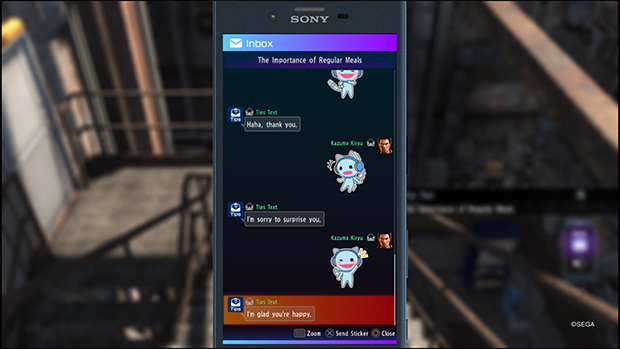 The localization team has done a fantastic job to keep you up to speed with terms and names of characters through loading screens and in the menu itself with a nice recap option for a brief overview on previous entry stories. Even if you don’t pay attention to this stuff, the plethora of story scenes and flashbacks in the opening will get you up to speed to enjoy this entry. I was skeptical myself when I booted this up for the first time for review having only played 0 and Kiwami in English and a portion of Ishin in Japanese. You don’t need to worry if you’ve never played a Yakuza game before and this is a great way to get into the franchise. 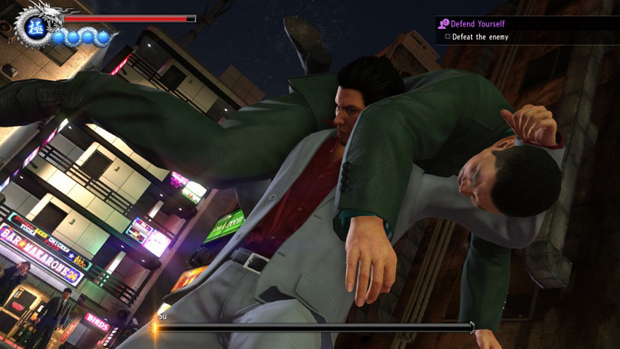 Characters and the story are highlights of Yakuza games. Yakuza 6: The Song of Life has been touted as the finale for Kazuma Kiryu’s storyline. Without getting into spoilers, Kazuma Kiryu finds himself in prison for a bit before he gets out and goes back to the orphanage where he aims to live with the children who he fostered. Haruka who is basically the closest person he has to family and who is treated like his daughter has gone missing. She is an idol who found herself stepping away from the limelight after people start discussing her connection with the Yakuza (through Kiryu). You begin your journey trying to find Haruka and go back to a place that is beyond familiar. 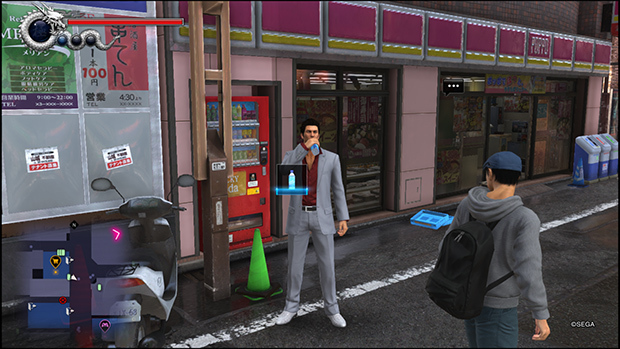 Kamurocho has changed a lot since Kiwami and we are now in 2016 (in game). One thing leads to another and you run into some old friends and even make new ones as you look for Haruka while trying to find who the father is for her child, Haruto. The most interesting thing here is how Kiryu is treated like an old man. Sure he can fight and be a badass but tonally he is still old and is treated that way when the younger clan members deride him. The story here isn’t just a crime drama or something like that but set in Japan. Contrary to what people expect at this point from a Yakuza game, this one tells the story of the bond of a family. This extends to non blood relative families and just how the family unit is a thing and how some are willing to risk it all for their family. I love how the supporting cast plays such a brilliant role in the overall story here. In a lot of games, the story is usually just about one or two people but the bond between Kiryu and his new found partners and even some older characters in the franchise is really great. There are some pacing issues in the middle but overall this is a worthy send off to one of the most iconic characters in gaming in Japan. Seeing Beat Takeshi in the story was really something. In my 20+ hours with the core main story and 10 more playing mini games and just exploring both regions, the word I thought about the most was “seamless”. 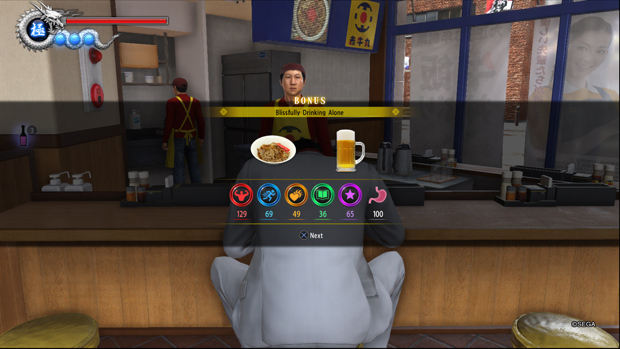 I love how you can just walk into restaurants and sit down at street food joints to have a meal with no loading screens. Many office buildings even let you just randomly walk in or walk up stairs and trash the place. This is something I wished I could do in GTA games in the past. Combat is super fluid and you can get in and out of fights instantly. Just running into thugs or clan members on the street will trigger a fight where you can even run into someone from far away and drop kick them. Combat has been overhauled completely from previous entries and you have one detailed main style with an extra mode that is basically Kiryu on steroids. I love the experience system that lets you gain different kinds of experience and level up stats or learn skills as you please. This system is very flexible and you are rewarded for doing almost anything like drinking a can of iced coffee from a vending machine. While the Karaoke in 6 was disappointing compared to 0 when it comes to the song selection, I love the minigames here. Live chat is obviously the first thing I tried and it is one of the most hilarious things you will experience in gaming. Seeing Kiryu type out adult phrases given his normal demeanour will make you smile. The cat cafe was another highlight but I actually know some people who are buying Yakuza 6 just to get Virtua Fighter 5 on PS4. You can actually play the full PS3 and Xbox 360 Virtua Fighter 5 Final Showdown in Yakuza 6 on PS4 in the arcades. The classics make a return as well but Puyo Puyo and Virtua Fighter 5 are the highlights when it comes to the games you can play within. The Clan Creator game is pretty in depth but I didn’t much care for it once the initial charm wore out. When Yakuza 6 (Ryu Ga Gotoku) was revealed, I was blown away by the visuals. It looked almost unbelievable and the final release is mostly great. During the day, some of the visual issues are more apparent through shimmering and screen tearing on the base PS4. At night, things look absolutely gorgeous in both regions. On the PS4 Pro, I had almost no screen tearing but the shimmering is still an issue. The higher resolution on the Pro and more steady frame rate is a welcome upgrade. The performance is still disappointing coming from 0 and Kiwami even though both of those weren’t designed only for PS4 and had PS3 versions as well. 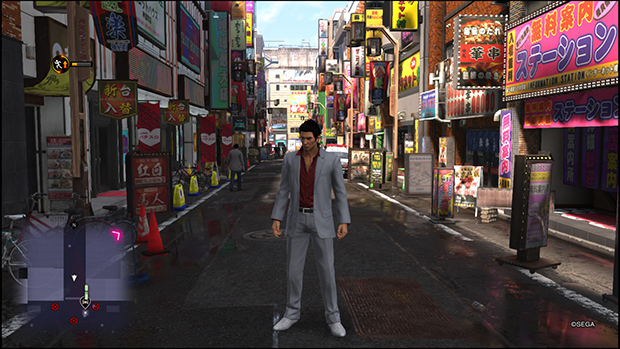 Character models are absolutely stunning and Kiryu has never looked better. Serena looks and feels more like a real bar than ever before. Music here has been hit or miss. I say miss because the Karaoke selection is disappointing. The in game music on the other hand is very nice. Combat themes and the new Serena arrangement are all great. I am a bit disappointed that SEGA couldn’t license the ending theme that played during the credits in Japan though. Yakuza games never see opening and ending themes with licensed songs remain unchaged sadly due to how licensing is. I know this is not the last game with Takaya Kuroda from the Yakuza team but I feel like he outdid himself here. Outside of a few pacing issues, the only real downside to Yakuza 6 is how some of the locations have blocked off segments. For a game that prides itself in a seamless experience, seeing actual roadblocks in the streets blocking you from exploring areas available in older games is annoying. If you own a standard PS4, there’s also a lot of screen tearing in some areas. Given this release is one and a half years after the Japanese one, I was hoping some of the visual and performance issues would be fixed but this is exactly as it was when it released in 2016 in Japan. Yakuza 6: The Song of Life is a fantastic game and one every PS4 owner should play. It isn’t as amazing as 0 but its a damn fine game and a great entry point into one of gaming’s lesser known franchises. The quality of life enhancements and improvements and visual upgrade make it one of the craziest and best open world games available today.